Approximately 24 miles northwest of Jersey sits a little known surfing gem: the small Island of Guernsey. 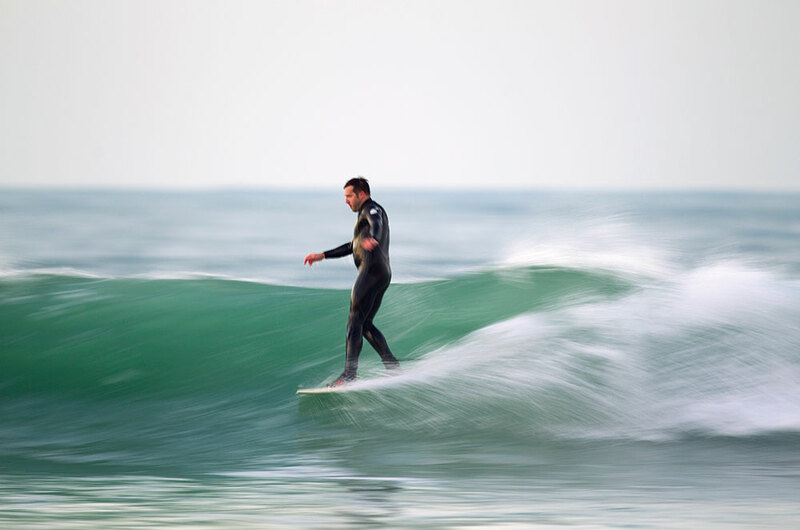 When people think of surfing in the Channel Islands, chances are their first thoughts will turn to Jersey, which is understandable as Jersey has had a higher profile since the 1960s and has been at the forefront of the development of British and European surfing. Much of their success can be attributed to the quality, variety and consistency of their waves which has led to the overall high standard of surfing. But, that said, it is only part of the story. 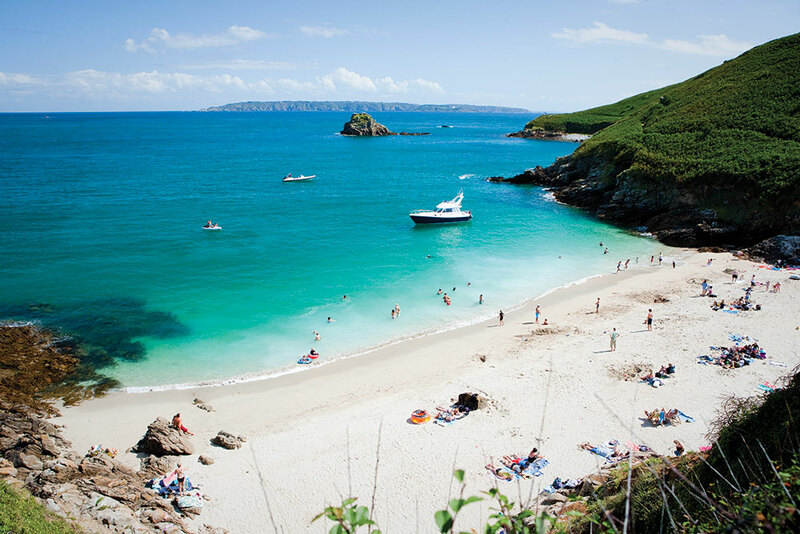 Approximately 24 miles northwest of Jersey sits a little known gem: the small Island of Guernsey. Seemingly happy to take the back seat much of the time and bask in obscurity, they have often kept themselves to themselves. This has not always been the case with a thriving club in the 60s and again in later years from the 1980s through to early 2000. Periodically Guernsey surfers emerge to rival the Jersey boys or make their mark on a wider stage. Guernsey is a beautiful island, measuring a mere 25 square miles with a population of around 66,000-68,000 people. It is the westernmost and second largest of the Channel Islands and the correct name to apply is ‘The Bailiwick of Guernsey’ as it includes the stunning islands of Alderney, Sark, Herm, Brecqhou and Jethou as part of the domain. Guernsey’s geology is mostly igneous rock and the surf spots are largely reef and boulder waves with a few sand bottomed breaks dotted around the coast. With an enormous 10 metre tidal range, a north western aspect, narrower swell window, small enclosed bays and some blocking outer reefs, conditions are understandably not that consistent. Also, things can change rapidly and local knowledge, plus a nippy car, are essential to make the most of the situation. Despite these drawbacks, the waves are invariably crowded and even mid-week sessions at the best breaks are often busy. Now, let’s break down a few things that spring to mind when we think about “The Rock” as it’s affectionally known. Firstly, it’s a pretty cool place to live and to grow up. It’s surrounded by natural beauty and the fact that it’s so small means it’s never very far to go for surf as one can easily access coasts that face differing directions to make the most of the conditions. It has a genuine community feel to it as everyone knows everyone else, especially down the beach. Surfing started as early as the mid 1950’s with Roger Berry and his father making hollow boards and surfing at Vazon and Portinfer. By 1960/61 Vazon was being surfed by Pat Evans and Dave Fletcher, who were soon to be joined by Paul Birtwhistle and Eric Powell, our local windsurfing pioneer. Later Vince Chappel, Roger Blatchford, George Head, Tom Woodford, Terry le Pelley, JJ Shayer, Bob Warry, Dave le Tissier, Keith Ogier, Steve Bichard, Richard Browning and many others took to the waves on a variety of boards- all huge! Dave Fletcher formed a club which was eventually formalised with a constitution and the election of officers in 1964. The Rock is home to a decent variety of waves. The best place to start is the hub of Guernsey surfing, which is, without a doubt, Vazon Bay. Vazon is the biggest surfable bay; it’s the most surfed and has a number of different spots within the bay. This is where pretty much every Guernsey surfer learnt and got hooked. We can all still remember the feelings bombarding the senses when learning at Vazon. Vazon Bay itself offers six main surf spots depending on what the swell, wind and tides are doing. Firstly, is the most surfed spot on the island “The Beach.” In 1968 the Surf Club negotiated with the local government, ‘The States’, to have an area of the beach specifically for surfing. This has proved a fine legacy and has helped with managing the beach for all users over the years and has been fundamental in protecting the development and progress of surfing in Guernsey. This area offers slow crumbling waves that peel, predominantly right, towards the gap in the reef known as ‘The Alcove’ with the occasional left spinning off the side of the reef. This is the favourite spot for a large cross-section of surfers including the local longboard community, beginners, several talented shortboarders like Nathan Browning, Ben Gathercole, Matt Phillips who favour ‘fish’ or similar high volume craft, and is also the site of the surf school, which has now been running for five years. There are a host of ‘older statesmen’ still surfing, many who have surfed since the early days in the 1960’s. Still surfing each week and into their 60’s are the likes of Bob Warry (1966 Champion), John ‘JJ’ Shayer, George Warren, Chris Ashwell, Kevin Hinshaw, Richard Browning, Dave Critchlow and, perennial waterman and our oldest participant, Stephen Heyworth. They divide their time between Vazon and high to mid-tide Portinfer, which can be a good wave for longboards until it drops and then it becomes the domain of the shortboard crew. Next to the beach is the Reef. The Reef is a high tide spot that consists of a short left and right hander. Both have nice steep take-offs with the odd cover up. This is usually where people are initiated into surfing over rocks and was always a baptism of fire in the days prior to the advent of the leash. To the left of the Reef is T’Others (short for The Other Side/T’Otherside). It has a rock and sand bottom and offers arguably the longest right hander on the island. On a big swell with a good sand bar in place it can have some fun playful walls. Although a big favourite among the longboard riders, when a strong swell hits it can morph into a classic performance wave, enjoyed by all surfers. At the south end of Vazon sits probably the island’s best high performance wave called ‘(Inside) Centres’. It needs a spring high tide and a decent swell to start breaking. It is a favourite of the higher performing surfers who revel in the fast, sometimes tubing wave. It offers a nice peaky take off giving you enough speed to lay down big turns or boost airs. Unfortunately, due to its close proximity to shore, it gets ridiculously crowded and collisions are pretty common when it’s on. This wave is a reform on an inside reef with ‘Outside Centres’ being the initial break and the wave that was originally surfed in the 1960’s. It is still a favourite when it is on and can also produce lefts and rights with a decent wall that can even be surfed through to the inside on certain days. Terry le Pelley surfed ‘Inside Centres’ alone in the mid 60’s first as he was not a confident swimmer whilst the rest were on ‘Outside Centres’. Barney Devenport nicknamed it ‘poop-poo’s Pipeline’… a ‘poop-poo’ is an old Guernsey term for a bit of a softie so ‘Chicken’s Pipeline’! ‘Richmond Corner’ is at the south end of Vazon and is rarely surfed as it fires when strong winds blow and a big swell is running. This can be a rare classic but rips are draining and peaks shift despite being over reefs. Moving north is Portinfer. The larger section of shortboarders choose to surf here from mid-tide down as it picks up slightly more swell, has more power and offers the opportunity to perform more manoeuvres on a wave. It does close out a fair bit but when you do get a good one, usually a few each session, you can snag a pretty fun wave. Every decade or so there are groups of talented surfers that compete and push each other and as a result they inspire the younger surfers to do likewise: Bob Warry, Richard Browning, Richard Gillingham, Mike Osborne, Alan ‘Punky’ Bichard , Dave le Tissier and many others from the 60s; Dave ‘Willie’ Wilson (1970 European Junior Champion), Kev Warr, Pedro le Poidevin, Nigel ‘Tissie’ le Tissier, Chris Ashwell, Mick McCormack, Keith Ogier, Steve Mollet from the 70’s; Matt Hoare, Steve Johns, Mike de Garis, Nathan and Jeremy Browning from the 80’s and leading into the 90s with the likes of Rob “Biscuit” Ozanne, Paul “Bishy” Bishop, Jonny Baird, Mike Hewyworth, the Torode brothers, Andy and Paul charging and pushing each other. Portinfer is where the majority of performance surfing now takes place. It’s where all ‘the boys’ have each charged over the years, particularly since the 80’s. These talented surfers, many of whom are listed above, yet many others who are not mentioned, were an inspiration to those succeeding them and to each other. There is now a new small group that are around the same age, that are talented and that have grown up surfing and travelling together; pushing each other every time they go out. The standouts are definitely Jake Warr, Tom Colley, Dan Hewlett, Matt Le Maitre (British University Champion), Johnny Wallbridge (CI Champ- Euro Team member) and Tom ‘Billy’ Hill (multiple champion and Euro Team member) who is arguably the best local surfer from any era, certainly since Dave Wilson in his prime. Tom Hill is pretty much leading the charge over here, as well as being one of the top surfers in the Channel Islands. He has got a top turn on him to be envious of and is probably the most powerful surfer to ever come out of Guernsey. Moving back south of Vazon is Guernsey’s premier spot, Perelle. Perelle is situated behind a little offshore island called Dom Hue. Here at high tide you can find a decent left with a slab-like take-off and a long walling ride and opposite breaks a fun carveable point break style right which can handle the best of swells. The right can have a challenging take-off which then leads into a long, walling, peeling ride with an inside tubing section in the right conditions. Guernsey is an ideal longboarding venue hence this discipline is highly popular with all ages and abilities. Josh Sexton is our most successful competitor with some class acts in the wings such as, Matt Bailey, Gregg le Tissier, Will Jones, Danny O’Hara and a host of others nipping at their heels. Most encouraging is the recent upsurge in junior surfers. Following a lean spell in the late 2000’s, we have some talented prospects down at the beach headed by Louie Tostevin, Will de Garis, Joseph Gaudion, Tom Wood, Tom Symes, Elliot Wilson, Marley Montgomery, Evie Wood, Ruth Berry, Hannah Cable, Honor de Garis and all their friends. It is fair to say that surfing is thriving in Guernsey with three surf shops serving surfers needs: Pete Norman’s ‘Freedom’ at L’Islet, Johnny Wallbridge and Robin Ozanne’s ‘Yak Wax’ opposite Portinfer and Brian Vohman’s ‘Sail or Surf’ based in St Peter Port, along with some other more boutique style shops selling surf orientated gear. The surf school is popular throughout the summer and is successful at sharing the stoke with the newcomers of all ages. The Guernsey Surf Club is in the midst of a resurgence, with a host of plans in the pipeline and is well supported with Chris Ashwell, Ross Yeates, Al Mitchell, Martin Brouard and Kevin Hinshaw at the helm supported by a host of willing supporters. Thursday Club Longboard Division is also popular with Martin Brouard at the helm, who also sorts out the Guernsey Surf club web-site at guernseysurfclub.com. The club has their 50th Anniversary next year which makes it one of the oldest clubs in the world. Maybe we are not such an obscure backwater after all!